Home / Blog / How to Create Amazing Panoramas with Your Drone. Panoramic photography is a technique of stitching multiple photographs into a single large panoramic shot. This article covers the basics of panoramic drone photography, and offers a few helpful tips on camera settings, composition, stitching, and post processing. 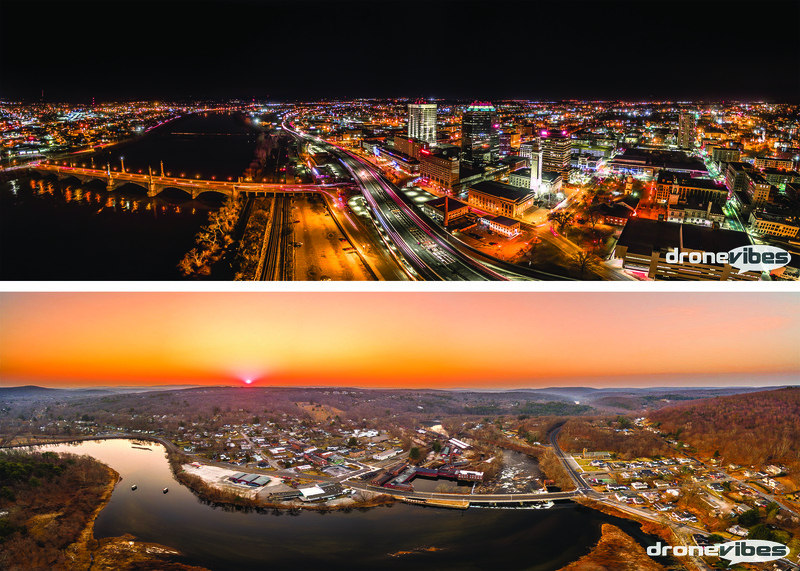 Sunset, Twilight, and Night Drone Panoramas. Captured with DJI Phantom 3. Panoramic photography technique is used to create images with horizontally elongated fields of view. It is also sometimes referred to as wide format photography. The panoramas are combined from multiple overlapping images that are stitched together using specialized software. The resulting image is a wide strip, with aspect ratio from 2:1 to 10:1 and beyond, covering fields of view of up to 360 degrees. We are now on Instagram! Follow @thedronevibes for some great drone photography tips and inspiration. Why use panoramic photography technique? This technique offers an artistically pleasing way to create wide shots impossible to create even with some of the widest lens. It is also beneficial when used with fixed lens cameras, which makes it a great technique to experiment with in drone photography. 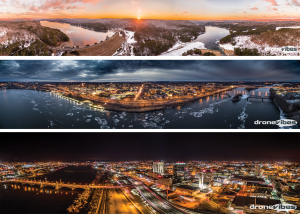 Panoramic photography offers a way for owners of even the entry level drones (Phantom, Blade Chroma, Yuneec 500, or Solo) to create images that can be used for very large prints without significant loss in quality. A high quality print usually needs 300dpi (dots per inch), standard quality prints can be done at 150dpi, and large format prints can get away with 96dpi (roughly a resolution of a typical LCD screen). More printed dots in an inch mean higher quality reproduction, and the dpi you ultimately choose really depends on expected viewing distance (the closer you’re expecting the viewers to be, the higher dpi you should use-so a magazine article print may benefit from 300dpi, while a billboard may get away with 72dpi or less). Why does this all matter? A typical small drone camera with 12MP resolution will offer images 4,000 pixels wide and 3,000 high (4:3). If printed at 96dpi, the largest print you can get would be roughly 41×31 inches (104×78 cm) – not terribly small, but not quite as large as you may need. A typical 8 picture wide and 3 pictures tall panorama (with pictures overlapping by 1/3) can yield an image roughly 11,000×4,500 pixels, which could be used to create 115×47 inch (300x120cm) large prints – yes, that’s 10×4 feet. If you don’t really need something this large, you can easily get a nice print 1/3 of that size at excellent 300dpi resolution. But enough with pixels and dots, let’s move onto the fun part. Listen to Petr and Erick talk about the Panoramic Drone Photography in the latest episode of our Drone Vibes Podcast. How to shoot panoramic images with your drone. Just like in regular photography, camera settings and composition are very important when shooting panoramas. While leaving your camera in Auto may give you decent results, setting your exposure and white balance manually works the best. With the camera left in Auto, you may end up with brighter parts of the photograph in warmer (amber) tones, while the shady parts may get a bit of a cooler (blue) tone. The key to keeping the white balance and tone consistent between all the panorama parts is setting your camera manually. The exposure will also change between the photos, it is important to properly expose each “tile” for best results. When it comes to composition, same rules apply to panoramas as to the regular photographs (rule of thirds, etc.). The only difference is that you don’t really see the final product composition until it’s stitched together later. Plan your panorama by looking around and exploring your scene first – this will get easier with practice as it becomes easier for you to imagine what the result will look like after you do a few. It also helps to take more pictures than needed-even cover the entire 360 degrees, and then experiment with composition by stitching your panorama from only some of the pictures. High contrast scenes (sunrise, sunset) may benefit from using the HDR technique. Perhaps my favorite kind are long exposure night panoramas, combined from long exposure (1.5-4 second shutter speed) photographs. 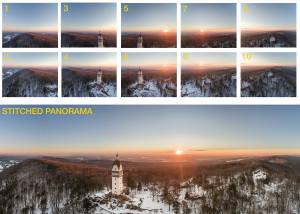 In this case it’s really important to take multiple shots of each image (5-10), so you can pick the sharpest ones to create your panorama from. Even one blurred tile in a 15 picture panorama may ruin the entire pano, so a lot of patience is needed here. The amount of overlap may differ with conditions and the proximity to objects. I find that moving between the photos by 1/3 works the best, you can move by as much as 2/3 and still get a decent results in shorter time. To help with the reference points, I use a grid overlay for my live preview (most cameras and drone apps offer this function). The grid uses two horizontal and two vertical lines to split the screen into thirds, making it easy to pick reference points accurately – if I’m moving vertically (top to bottom), I simply look for an object in the image (house, tree) on the bottom one of the two horizontal grid lines, take my picture, and then tilt the camera down until this object lines up with the top line before taking the next shot. Similarly, if I’m moving between the images horizontally (left to right), I choose an object intersected by the right vertical line on the screen, take the shot, and then yaw the camera/aircraft to the right until this object is intersected by the left vertical line before taking the next photo. Shoot the vertical images first before moving in between the horizontal parts – so for 3×6 tile panorama, take the first three shots from top to bottom, then yaw to the right by a 1/3, take your next three top to bottom, move to the right again, and continue in this pattern until your pano is done. I’d recommend always taking at least two sets in each location – this should prevent any disappointment if one of the images become corrupted or missing. There is nothing worse then coming home thinking you got a great pano, just to discover that one of the images is missing or damaged. Notice the large overlap between the 10 pictures used to create this panorama. How to stitch and edit panoramas? There are quite a few programs that can be used to stitch panoramas. Adobe Lightroom or Photoshop offer a fairly simple and automated way to stitch the panoramas together, AutoPano or PTGUI are great if you need to manipulate images within the panorama, stitch 360degree panoramas, or create manual reference points. In general, I prefer using the Lightroom for most of my panos, and AutoPano for the ones that Lightroom has difficulties stitching. Most programs will give you an option to select panorama projection – choose spherical projection for any panos with multiple vertical images. You can select a cylindrical projection for the panoramas with only a single vertical shot (panos when you only move horizontally between the pictures). It is very beneficial if you correct any lens distortion first, and also remove any lens vignetting (darker areas along the edges and in the corners of your photos) – both easy with the Lightroom. Removing the lens distortion will result in cleaner stitches and help prevent any undesired “steps” in horizon. Correcting the lens vignetting will mitigate dark vertical smudges across your sky, leaving it more consistent – especially important whenever there are no clouds. If you’re combining the panoramas out of bracketed images (AEB), do not use the auto-tone function in the Lightroom or Photoshop. This would be similar to leaving your camera in auto and will result in inconsistent white balance and tone across the pano. Try to minimize any color grading beyond basic exposure adjustments until the pano is stitched together. After your panorama is stitched, you may need to crop it down to remove the gaps along the outer edges of the pictures. Adobe Lightroom offers a function called “boundary warp”, which can be used to “stretch” the outer boundaries of the images to eliminate these gaps and reduce the need for cropping. Some cropping may still need to be done as the objects near the edges of the pano will appear stretched by using the boundary warp function. After the stitching is done, you can proceed to grade and edit your panorama just as any other regular photograph. You can remove any undesired steps in the horizon with a help of a healing/cloning brush, the same applies to any dark smudges in the sky caused by lens vignetting. When saving your panoramas, I’d recommend saving a JPEG version at 96dpi and 300dpi (easier to share/transfer), and then lossless (uncompressed) TIFF versions for printing. Panoramic photography technique requires a bit of practice and a lot of patience, but you will be rewarded by very unique beautiful images that will look great even on large format prints. Connect & Comment: ask us any questions about this topic in our forums, Share your panoramas with us – simply use tag #dronevibes on social media! Thanks you for doing these I learn so much from them!!! You’re welcome David. Please, tag #dronevibes when posting your work on social media, I’d love to see what you’ve done with this! Cheers! Hi, I’ve just watched your video beause I wanna try make some panoramatic photo by my P3A but I still don’t feel confident with my camera settings. I know you’ve pretty much explained everything in your video but it would by much more better and easier for me to discuss it in my lenguage. Even if your english is pretty good i noticed your accent which is very familiar to me. And after finding your name I’m sure y r my man… Maybe I’m wrong but if not do u thing u can give me some tips through e-mail? Thanks! Hello Ondro, you can message me here in the forums or through my facebook page. Czech?